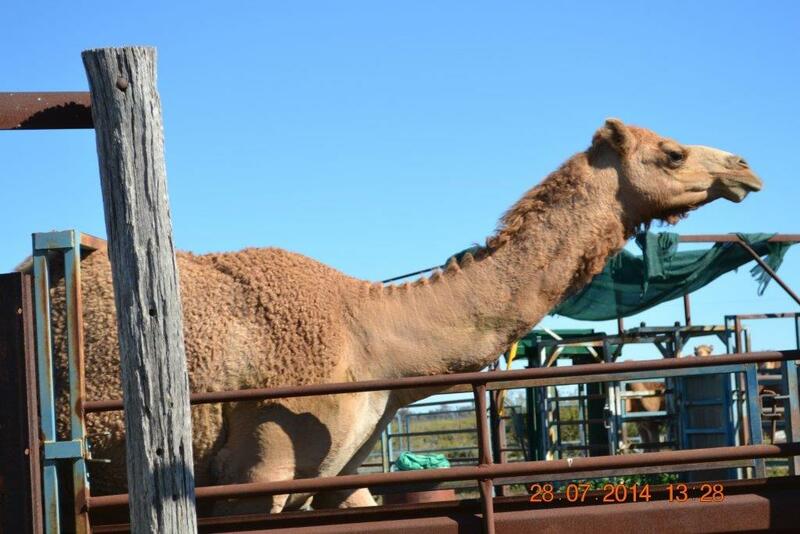 I’m not sure if I’ve mentioned this before but we have camels. Thirteen of them. We had fourteen but one was either struck by lightning or bitten by a snake, either way the end result was the same. One of our neighbours firmly believes our 13 camels are the reason it won’t rain and has hinted that he would be happy to take one off our hands, however I’m not sure about the reason for his offer; I think he saw the cooking segment on TV earlier this year which encouraged us all to exchange the baked leg of lamb for one of camel and just invite a few more dinner guests! End result; same. I must say, looking at them in the yards the other day, the idea does not appeal to me and I would certainly need a much bigger oven than the one I’ve got….I do need a new stove though…. Back to the live camels. 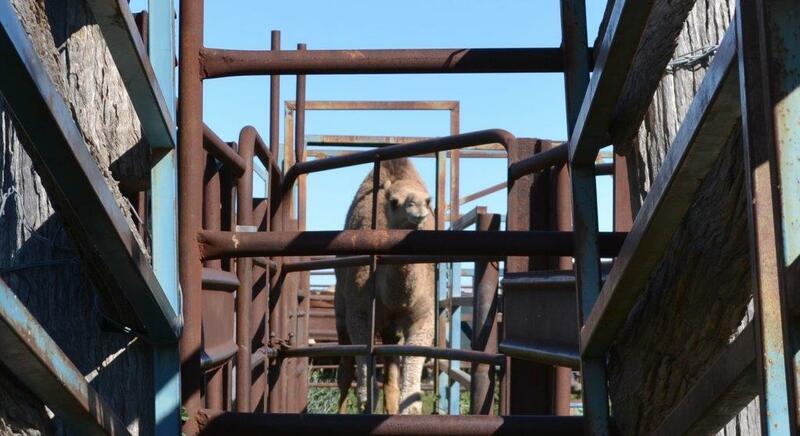 We had them in the yards to put a National Livestock Identification System (NLIS) tag in their ears. An interesting exercise, although the boys would probably use quite different terminology! And I shouldn’t say we – I kept a safe distance, issued baseless warnings, offered useless instructions and played amateur photographer. I’ll go back a few steps and explain a bit about our Camelus dromedarius or Dromedary; Arabian camel and what we have learned since they arrived here in March 2012. Firstly you need to be licensed to own camels because they are a Non-Indigenous Animal and records must be kept and annual returns provided. The application process is quite involved, for good reason, but not as onerous as first anticipated. Having got all the paperwork out of the way I will tell you they are all de-sexed males; meaning they are very well behaved, at least as far as male camels go! They don’t like being separated and will fret if parted from each other, they require a different style of mustering to cattle or sheep and will more often follow the vehicle rather than be guided from behind. They do not like going through new gate-ways, no matter how wide and much patience is required whilst attempting this activity! Why do we have them? They apparently love anything with a prickle, including mimosa, box thorns, Bathurst burrs, etc. and utilise around 98% of what they eat. Seeds are supposedly sterilized when they pass through the camel’s gut, so it was originally part of an experiment in slowing down the spread of these weeds, but the camel to mimosa ratio favours failure at this point in time. Camels browse rather than graze, except for new grass shoots (none of those at present), they like salt-bush but not enough to overgraze and did develop a liking for the mix we were feeding the cattle earlier in the year. I’ve also been warned to keep them away from my fruit trees! So, back to my tale about Camelus dromedarius (dromedarii? ), yards and tags. My initial concerns regarding how the camels would behave in the yards were quickly allayed as was my consternation about how they would get under the braces on the gateways; they simply ducked their head and the few inches of hump that was taller than the brace just “squished” down and bounced back up again. AMAZING! They didn’t seem worried at all about that part…..once they eventually went into the race!!! Remember what I said about gateways…. Even the process of tagging didn’t seem to faze them as much as I anticipated, although there was the odd attempt at biting whoever was doing the tagging, but once freed from the cattle crush and allowed to escape to the adjoining yard and the company of the other animals, they quickly calmed and were even somewhat inquisitive (or concerned) about what was happening to their counterpart in “that trap”. I have to say I was impressed by my boys’ patience which (mostly) lasted for the duration and by their willingness to get in the same yard with such large animals who, equally as impressive, did not display any of the traits I had heard and feared they might. Their lack of aggression towards Jeff and the boys, considering this was only their second time in our yards and not being used to human contact at such close quarters, has given me some new found respect for the much maligned “ship of the desert”. That doesn’t mean, though, that I’ll be sailing on one any time soon! The annual CWA Agricultural & Environmental seminar was held recently, with this year’s topic, “What Milk is in your Fridge”, providing an interesting and enlightening two days. Mr Gavin Moore from Gavana Holsteins, Camden was our host on Monday. His farm was originally purchased from Hannibal McArthur (John McArthur’s brother) in the early 1800s. Gavin is a 6th generation farmer and is passionate about his farm and the dairy industry. His dairy and facilities have been designed to accommodate visitors on educational tours. The farm annually hosts 2500 primary school students and 1200 adult visitors from Korea, China and Japan. Gavin has input into the current primary school curriculum regarding food and fibre. Gavin gave us a generous morning tea and lunch while talking about the history of the dairy industry from hand milking, to producer owned processing facilities, the $1 a litre milk, to boutique processing facilities. 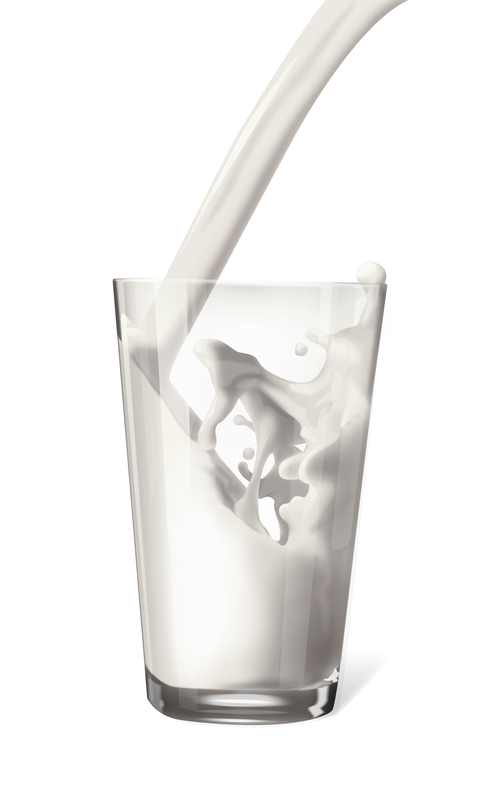 For more information you can visit Dairy Australia, or Country Valley Milk. Pierre aka Pepe Saya began a culturing butter business after he made 20kg of butter from 200 litres of excess cream. The unpalatable butter fiasco encouraged him to learn the art of making cultured butter. His now very palatable product is sold at farmer’s markets and selected stores. Dr John Pearce from the Manildra Group discussed the chemical components of milk and the composition of commercially available milks. Robyn Slade of White Cedars Goat Stud gave samples of her goat’s milk soap – all natural ingredients. Robyn informed us of her passion for goats and various uses of goat’s milk. WIRES representative, Caroline Enfield, spoke on the wedge-tailed eagle, our current fauna study topic. Wedge-tailed eagles are Australia’s largest bird of prey. Caroline said many birds are brought to WIRES from car accidents. Our grateful thanks to Joy Beames, State Agricultural & Environmental Officer, for organising our tour and great speakers who delivered their information with humour and panache; we all enjoyed the seminar immensely. In 2002/3, which was when we last had to drought feed and when all the children were still away at boarding school, I was the 2IC (sounds better than gofer and general dog’s body) on the farm, including the daily feed run. Back then we used a modified A-84 header bin as our feed cart and it was my job to stand on the opposite side of the trough and open and close the chute, whilst trying to make sure I didn’t asphyxiate myself on grain dust or get barrelled by a hungry beast. Who needs bungy jumping for an adrenalin rush! We used our old tipper (no brakes) to deliver the hay bales and an empty 1000ltr chemical shuttle to deliver molafos (a molasses based liquid feed) into roller lick drums. All separate trips to different paddocks on different days whilst also checking to make sure stock hadn’t got bogged in a boredrain (water channel) and needed rescuing, or worse. 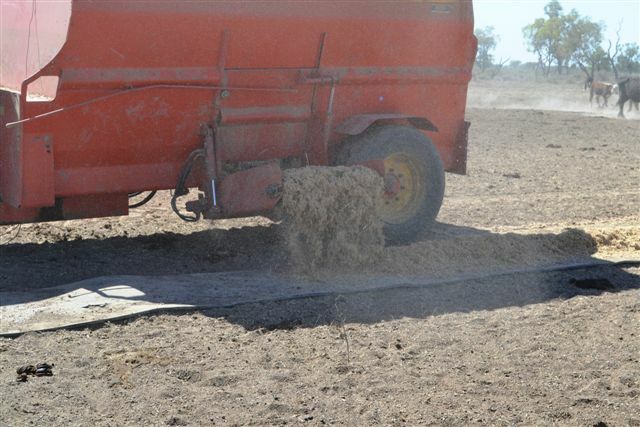 At the time we had, what we thought, was more than enough feed on hand in case we encountered a dry spell. 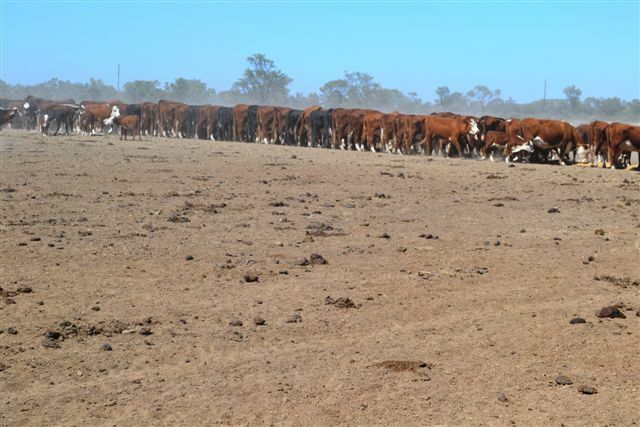 After all we hadn’t had to hand feed stock since the ’65 drought, but you never know…. so through various means, including the offer of irrigated wheat stubble from Jeff’s best mate and some bartering, we were able to increase our stores of hay, as well as those of our neighbours who participated in the operation of harvesting, bailing and carting, hence the barter reference. Since then we have capped and piped the boredrains and instigated (at our own expense) some drought preparedness measures which, like most farmers, puts us way ahead of current government solutions and invested in a feed mixer, roller mill (for cracking/crushing grain if necessary) and increased the amount of storage and feed we retain. The mixer not only combines all the necessary ingredients to produce a loose muesli bar type concoction that the stock just love, its chute magically lowers/opens from the tractor cab! 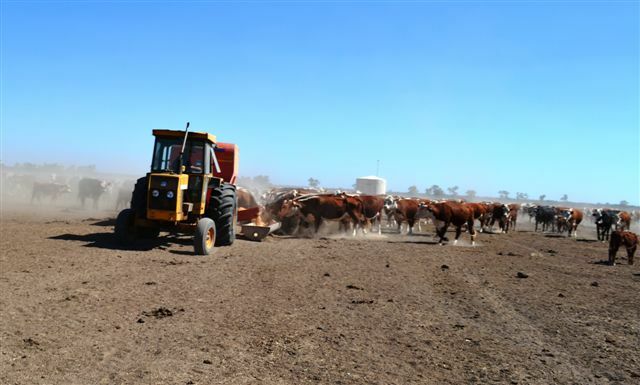 As both our boys are now home and seeking to oust me from my 2IC spot, as well as the time I spend away from home in my role as State President, I have been a bit sheltered from the daily rituals and realities of the farm, especially drought feeding. At present though they are both away for several days, earning some off-farm income, so Jeff asked if I could “run the gauntlet” for him on the daily feed run. I was, at first, a little perplexed because we have the whizz bang ‘triple m’ (magic mixing machine) and wondered why I would need to leave the comfy air-conditioned space I had become accustomed to now that we have “staff”… Unbeknownst to me, because of my now ‘cushy’ lifestyle, the cattle love their muesli so much they want to make sure they have a space at the trough (or belt), even if that means being run over by the tractor and the “m & m” machine!! 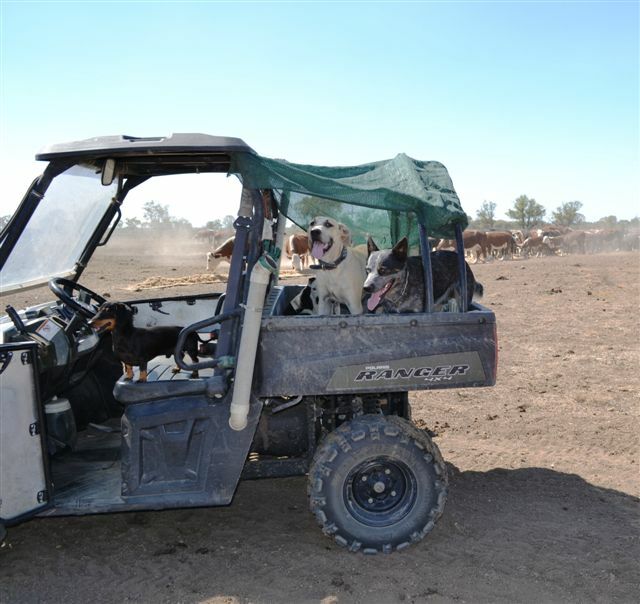 So “running the gauntlet” involves driving our All Terrain Vehicle, fully loaded with barking dogs, in front of the tractor, to push the stock out of the way. Not difficult, bit dusty and noisy, but definitely safer (provided I keep a safe distance in front of the tractor) and easier than the last time my services where required for such a task. We also now feed everything in one place; sacrificing one paddock rather than all. Please don’t think I am trivialising drought, being flippant or a “princess”, sometimes the only way to survive is to look for a positive. I also acknowledge that we are luckier than many with our reliable access to water and because we have not had to feed for anywhere near the amount of time that some have. But I also remember what it’s like to arrive in the paddock with a hot westerly blowing and the temperature already heading for 40°C, carrying feed for hungry cows who have decided that, to survive themselves, they have to abandon their young calves. There is nothing on this earth more demoralizing, for a farmer, than watching his stock suffer and try as he might, still be helpless to do anything. Most disasters these days, no matter where in the world they occur, generate almost 24/7 media coverage with every outlet competing for the most sensational story and every person with a mobile device constantly uploading photos or video footage to social media. Slow, insidious drought, affecting those of us with little voting power but which could ultimately affect millions, doesn’t seem to rate more than a 3 minute grab as a sob story. Angelina Jolie’s visit to Luna Park seems to be more important than what’s happening in outback Australia. Wonder if she could be persuaded to make a movie about drought….. True to form though (and to try and end on a positive note) Aussies are good at helping each other, especially when there is no bureaucracy involved. Have a look at https://www.facebook.com/voiceofthebush to increase your awareness or share a story and http://www.thirstycow.org/ if you think you can help, or if you need it.